"A THRILLING TAKEDOWN OF AN ELITE INSTITUTION ... SO READABLE AND RELATABLE THAT IT WILL SPEAK TO THE AVERAGE US CITIZEN." Click here to read the entire review here. "VAN DRIEL’S PROSE IS FULL OF EMOTION AT TIMES, BUT IT MOSTLY MAINTAINS A TONE OF COOL, ANALYTICAL OBJECTIVITY, MAKING HER INDICTMENTS ALL THE MORE PERSUASIVE. INDEED, THIS IS A RARE EXPOSÉ IN THAT THERE’S NO SHORTAGE OF BOMBSHELL REVELATIONS BUT NOT A HINT OF SENSATIONALISM." The Culture Corner - Bonnie Gilgallon interviews Barbara on iHub Radio. The Desert Sun - Palm Spring’s Top Newspaper “The Desert Sun” Chooses It Never Happened as their HOT PICK. 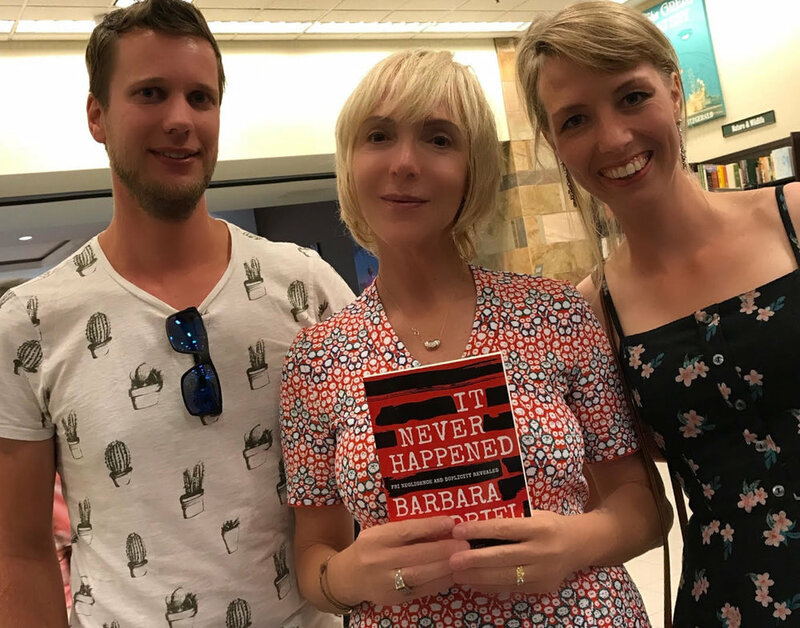 Blog Talk Radio - Host Cyrus Webb welcomes author Barbara Van Driel to “Conversations LIVE” to discuss the writing of the book It Never Happened and what she hopes readers glean from it. Description: Barbara will be introducing her memoir It Never Happened. Discussion and signing to follow. Open to the public. Description: Barbara will be reading/signing from her memoir It Never Happened. Open to the public. Sign up to Barbara’s mailing list below to be the first to receive publication news, exclusive announcements, giveaways, and more.